Join us for this very special January Wednesday Residency with Funktional Flow! Each week Funktional Flow will bring in a different special guest opener and each week will feature a different theme! We’re also offering a limited edition 4 show pass for only $30.00. This pass will get you in to all 4 shows at a discounted rate! Keep an eye out for the themes and special guests and we’ll be announcing them soon. We look forward to making hump day in January extra fun! Hailing from Buffalo, NY, Funktional Flow is a multi-genre quintet heavily rooted in rock and reggae, with a funk foundation. Over the past six years, the band has released three albums and played hundreds of shows throughout the Northeast and beyond. With the release of the newest album “Time Will Tell” on March 5th 2016, Flow is poised to take it to the next level and branch out nationally. Flow is heavily influenced by Sublime, Umphreys McGee, Moe, and Blind Melon but maintains a fresh, high energy sound that results in a diverse catalog of music. 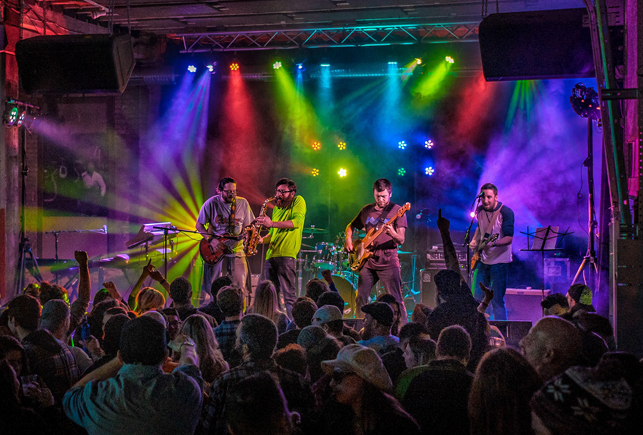 Since the bands establishment in 2010, Funktional Flow has played notable music festivals such as Catskill Chill, The Great Blue Heron, A Bears Picnic, Buffalove Music Festival and Night Lights Music Festival. They also host their own festival, “Flow Fest”, at Woodlawn Beach located on the shores of Lake Erie, just outside of Buffalo, NY. Funktional Flow has shared the stage with many notable acts including; Warren Haynes, Railroad Earth, Rusted Root, New Riders of the Purple Sage and members of Little Feat. The Flow has succeeded in making a name for themselves throughout the North East and beyond; continuously earning recognition from musical publications. Recently the band was voted “Best Original Alternative Band” in Western New York. Also featured in Relix magazine’s “On the Rise” section and was a previous winner of the coveted Artvoice “Best of Buffalo” award. Dubbed a multi-genre monster, Funktional Flow is best experienced in its natural state, a live performance.